John Munster was born uptown and lived in New Orleans his whole life. You could have seen him anywhere from Pontchartrain Beach and Bali Hai to working on the riverfront like his father, John Sr. John and his family were devastated by Hurricane Katrina and had to relocate 50 miles north. One of his biggest joys in life has been to travel with family, which lately he has had to restrict. 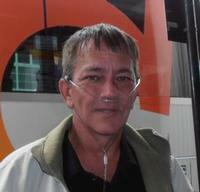 Unfortunately, John is in need of a double lung transplant. He was diagnosed in 2008 with primary pulmonary hypertension (PAH) which has caused his lungs to stop absorbing oxygen from the blood. Since diagnosis he has been on oxygen 24 hours a day. He is now on the waiting list for a lung transplant at Oschner Foundation Hospital in New Orleans. This will allow him a better quality of life. John’s family and friends have the task of raising funds to assist with the monumental expenses needed for surgery and care after. Not many families have the resources to meet the financial obligations of transplantation such as traveling expenses for pre and post-surgery evaluations. At times like this, the help of friends, family, and community is greatly needed and appreciated to make his outcome successful.